The Skin and Cancer Foundation Inc explains everything you need to know about sunscreen. Sunscreens come in many different forms - from sprays and lotions, to broad spectrum and water resistant. So how do you know which one is best for you? Read on to find out what you need to know about sunscreen, including which SPF is best. SPF stands for Sun Protection Factor, and is a measure of a sunscreen’s ability to prevent one type of ultraviolet (UV) radiation, called UVB (think B for burning), from damaging the skin. UVB rays cause sunburn and several types of skin cancer. Sunscreens are made of a mix of ingredients to help prevent the sun’s UV radiation reaching your skin and come in a range of SPFs. Red skin is a reaction to UVB rays alone and tells you little about other UV damage you may have done. Another type of radiation, UVA radiation, penetrates deeper into the skin and can cause premature wrinkling, age spots and heightens the risk of some skin cancers. SPF 15, 30 and 50: which sunscreen is best? Because some UV radiation still gets through sunscreen and into your skin, the SPF number refers to roughly how long it will take for a person's skin to turn red. Sunscreen with an SPF of 15 will prevent your skin from getting red for approximately 15 times longer than usual. If you start to burn in 10 minutes without any sun protection, sunscreen with SPF 15 will prevent you from burning for about 150 minutes. If used correctly, SPF 15 sunscreen filters out approximately 93 per cent of UVB rays, SPF 30 filters out 97 per cent and SPF 50 keeps out 98 per cent. The Skin & Cancer Foundation Inc. recommends using a sunscreen with an SPF of 50+. No sunscreen can block 100% of UV rays, which is why it is important not to spend prolonged periods of time in the sun, even whilst wearing sunscreen. What about the + sign? The plus sign means 'more than'. For example, SPF50+ sunscreen must provide at least SPF60 in testing. This is because the same batch of sunscreen will test slightly differently in different laboratories with different methodology. By testing at SPF 60, it removes any margin for error. An average sized adult should apply one teaspoon of sunscreen to each arm, leg, front of the body, back of the body, and face including the neck and ears. Most people apply less than half this amount, which means they get far less protection than the SPF stated on the bottle. Ideally, you should apply sunscreen 20 minutes before being out in the sun, so it has time to absorb into your skin. Once you are out in the sun and are sunburnt, the sunscreen will be useless. Because most people don't use enough sunscreen and because sunscreen tends to wear or wash off after time, you should reapply sunscreen every two hours. No sunscreen should be expected to be effective for longer than two hours without reapplication. Is sunscreen by itself enough? Sunscreen should be just one of a range of sun protection measures. Remember to SLIP on a shirt, SLOP on some sunscreen, SLAP on a hat, SEEK shade and SLIDE on sunglasses. Water resistant sunscreen does not come off your skin during swimming or exercise, provided it is not wiped off. Even though some sunscreen is '4 hours water resistant' you should reapply every two hours to maintain the same level of protection. 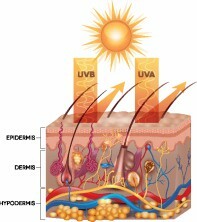 A broad-spectrum sunscreen offers protection from UVA and UVB rays, as shown in the diagram below. Active ingredients in sunscreens come in two forms, mineral and chemical filters to provide broad-spectrum protection. 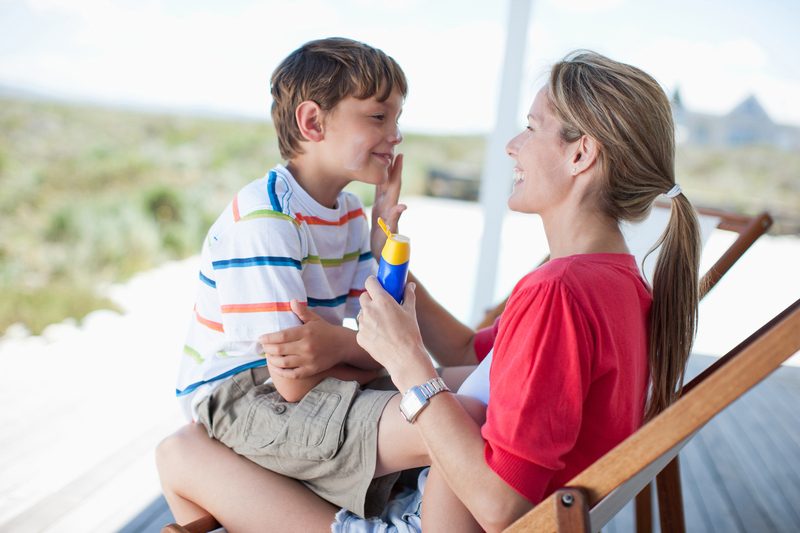 Broad spectrum sunscreen protects your skin from both UVA and UVB rays. The Skin & Cancer Foundation Inc provides specialist treatment, education and research on a wide variety of skin disorders, skin cancers and melanomas.